Ashton Woods Homes, a premier builder of eco-friendly and energy efficient new homes today announced being featured in the March 2011 issue of Big Builder Magazine. Headquartered in Atlanta, Georgia, Ashton Woods builds high-performance homes for sale in Atlanta, Austin, Dallas, Houston, Orlando, Phoenix, Tampa and Raleigh growth communities. Close to jobs, shopping and transportation, Ashton Woods effectively balances healthy-house features with energy efficiency in their Power House Green homes for sale – which could save homeowners as much as 45% per year on utility bills. 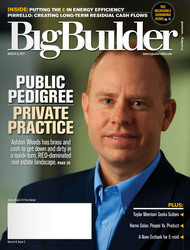 For their March 2011 cover story, Big Builder magazine interviewed Ashton Woods Homes—which, unlike other similar builders, was able to rise like a phoenix from the ashes of the homebuilding downturn in 2008 to a Top 20 of 100 status among homebuilders in the nation today. The article cites Ashton Woods as having the right business model, management talent, experience and funding which allows them to capitalize on current market conditions and be well positioned for new market conditions going forward. “Ashton Woods is a national builder waiting to happen,” says Ashton Woods’ parent company, Great Gulf Group President and CEO, Jerry Patava. At the heart of this rising tide is Ashton Woods' 12-member executive team, that collectively has over 200 years of new home building experience. With several of its members having worked, at some point, for the competition—Centex, Pulte, Lennar, Beazer, KB Home, and Toll Brothers—during their formative professional years. “[We’re] an entrepreneurial company with big builder disciplines,” says, Ashton Woods’ new CEO, Ken Balogh,. “Everyone in this room has got big builder experience,” he added. “Ashton Woods has combined the right elements of form and function that enable new homebuyers to personalize their homes and also save on utility costs with our Power House Green Program,” stated Tad Serbin, Senior VP, Sales & Marketing. Read the Big Builder article at http://tinyurl.com/BigBuilderCoverStory, or visit Ashton Woods Homes @ http://www.ashtonwoodshomes.com. Ashton Woods Homes is a subsidiary of the Great Gulf Group, a fully-integrated collection of companies that spans the entire real estate spectrum in North America. From land acquisition and development to the design and construction of master planned communities. For more than 40 years, Ashton Woods has built a solid reputation for building comfortable, energy-efficient, high-performance new homes and is honored with the most coveted local, regional and national awards. Visit http://www.ashtonwoodshomes.com for more information.